Inspirational new boutique project of 45 elegant and spacious apartments and penthouses located in an elevated position in the heart of Estepona with spectacular sea views. Ideally located a few minutes walk from the town centre and with easy access in all directions. Malaga International airport is only an hours drive and Gibraltar Airport 30 minutes away. Puerto Banus and Marbella are a little more than 15 minutes by car. South Bay is the perfect choice for those who are looking for quality cosmopolitan living close to all facilities and services. An ideal second home or all year round residence. Bright and spacious interiors that invite living and integrated open plan kitchens connected to spacious terraces with stunning sea views, top quality finishes adapted to the natural environment, energy efficient homes. 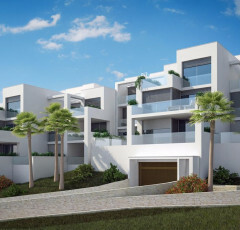 Beautifully designed living areas connected to large terraces with spectacular views over the gardens and from the penthouses lovely sea views. Designer kitchens with top appliances, oversized floor tiles, master bedrooms with ensuite bathrooms. Modern and elegant in design taking full advantage of the natural light and surrounding scenery. The complex offers a choice of 2 and 3 bedroom apartments and penthouses with very large south facing sunny terraces overlooking the sea. Spacious modern apartments with high quality specifications created and designed so that everyone can choose their dream home. All the apartments have a parking place and a storeroom. Bedroom wardrobes with interi panels. Kitchen fited with top and bottom units, with worktop in quartz. Control points on all entrances to complex. Internal and private Green zones with urban furniture. There are others apartments with different meters and prices.